In January 2004 Barry Cargill, working for ABLE DEMOLITIONS & EXCAVATIONS PTY LTD., VICTORIA, AUSTRALIA was working on a bridge demolition project in Melbourne. ABLE were removing the concrete deck off an old railway bridge in Melbourne, the Sandridge Bridge, and within it they found double headed rails from Blaenavon, Dowlais, and Dronfield in theUK dating from 1877 to 1883. They also found flat bottom rail from Moss Bay Steel (1884) BV &Co in Middlesbrough and Barrow Steel. More images on the Sandridge Bridge page. Barry was unable to source much information about Barrow Steel on the web so an appeal was sent out to various knowledgeable friends and groups . This page collates the feedback from this. Our company in Australia have been involved in a project for the removal of the concrete decking from a redundant railway bridge that was originally built in 1888 and which spans the River Yarra in Melbourne. The deck of the bridge was composed of concrete planks which were structurally reinforced using old steel rail. When the concrete was broken off to enable us to recycle the steel rail it revealed rail in very good condition so much so that many of the branding marks were identifiable. These branding marks on the web of the rails showed that our Victorian Railways had purchased rail from 5 different rail rolling mills in Great Britain and the rail had been manufactured between 1877-1883 (yes 120-126 years old). Originally Double Headed rails were made of iron and the idea was to invert them when they had worn, but alas they became severely dented over the area of the support given by the rail chair. I am not sure what happened when they were made of steel! Sometime after the development of double headed rail, along came bull head rail. The bull head rail does not appear to have been used on the GWR before the 1890s. Our first railway was opened in Melbourne in 1854. The first records of double headed rail being used was 1859, the rails, chairs, oak and trenails were imported from UK. After the 1870s the Victorian Railways went over to using flat bottom rails, but they still needed replacement bull head rail for lines already laid and this continued up to at least 1883. Note: The vast majority of the double headed rail was used as reinforcement ie as a tension member in precast concrete planks which were about 2 metres long and were used as bridge decking. In Melbourne the railways have not quite used it for the same exotic purposes. 75lb/yard rail has been used for posts for warning signs, as fence posts, as posts for railway occupation crossings and car parking bollards. So far the oldest rail I have found is being used as a car parking bollard and dates from 1876. I am slowly getting round to recording all of this. At my home station of Edithvale we have 1887 rail from Krupp! After WWII these old rails  many of which, originally came from Great Britain, were used for the construction of platform shelters, footbridges and railway boundary fences. The Victorian Railways in Australia gradually increased the weight of the rail it used on its main lines around the turn of the 20th century and thereafter, to allow for higher speeds and greater axle loads. The best history of Barrow Hematite Iron & Steel Co (previously Schneider Hannay & Co.) is still J D Marshall's Furness & The Industrial Revolution. Unfortunately its more geared to the machinations of company policy in the 19th Century rather than any technical or more modern (i.e. 20th Century ) information. Also its nearly 50 years since it was first published! Cumbria County Archives at Barrow have a little information on the works, but from what I recall its a small amount mixed in with Millom Ironworks information (and that is only what was recovered from thedemolition men). This is a section of Barrow rail dated 1870. I photographed it in October 2002 at the Colorado RailRoad Museum at Golden. From its date I'd suggest it was from one of the early lines in North Eastern Colorado rather than the later more well known Denver & Rio Grande. blast) A footnote gives the 1861 name of the works as Ulverston Haematite. mining interests (probably not relevant to your enquiry). They are also mentioned in passing in Lancaster and Wattleworth's 'The Iron and Steel Industry of West Cumberland' as being one of ten UK railmakers at the time of peak demand. owned Barrow Collieries, Barnsley from 1900-1935 where they had a number of coke ovens. Incorporated 1864 with the (7th) Duke of Devonshire as Chairman, Sir James Ramsden as MD and Josiah T. Smith as General Manager. Erected alongside iron works of Messrs Schneider & Hannay which were bought by the Steel Co. in 1865. Ten blast furnaces gave an output of 5000-5500 tons a week - recognised as largest ironworks in world. Later had 14 furnaces Tops enclosed from 1872 to make use of waste gases. Steel works commenced operations in 1866. Laid out with 18 5-ton Bessemer converters - reduced to 11 larger converters in 1879 - and eight larger converters from later date. Steel poured in 2-ton ingot moulds. Converters fed from 250-ton metal mixer sited between blast furnaces and converters. By 1903 four 18-ton converters were in use making 70 casts every 24 hours - or a capacity of 7,000 tons a week. driven by a pair of 40x60 horizontal reversing engines, with a 28 in roughing mill with a pair of 48x54 in direct-acting horizontal reversing engines, and a 28 in finishing mill with similar 50x54 engines. The Bessemer process was eventually supplanted by Siemens furnaces at Barrow though rails continued to be rolled. Company controlled some local iron ore mines, including Park (output 375,000 tons in 1872) and Stank There is a long section on the Company today - i.e. in 1937 with many dramatic b&w photos of the works - can supply some of this if you would like. There is some detail about the early history of the company in "Furness and the Industrial Revolution" by J D Marshall, republished by Michael Moon in 1981. From the Midland Rly's minutes books I learned that Barrow rails were supplied for the Settle & Carlisle Line from c. 1872 - they ordered them 25,000 tons at a time. I believe it was about 1961 when the blast furnaces were finally blown out. Did steel making cease at the same time? A wire mill continued on part of the site until the early 1980s (?). was closed and 'mothballed', but the ironworks was still operating. - and the works went back into production. It later became part of British Steel. After the early 1960s (I think 1961) no 'new' steel was produced,the works depending entirely on the remelting of scrap. Barrow Steelworks operated until 1983, and the site is now partly occupied by an industrial estate. After the steelmaking side of Barrow Hematite was acquired by the MoS in 1942, the ironworks continued to operate, still using the title of The Barrow Hematite Steel Co Ltd. In 1948 the iron works was acquired by Barrow Ironworks Ltd, although BHSCo continued to exist in a 'holding' capacity for the former subsidiaries who operated the Stainton Limestone Quarries and the Pennington Ore Mill. at a date which escapes me. The Barrow works, still using its BIW name, closed on 31/3/1963. The site is now part of the same industrial estate (part thriving factories, part desolation) that occupies the steelworks site. I hope this helps. Apart from the 1937 handbook, I don't think there are any detailed published references to the Barrow Hematite Steel Co Ltd. I would add that the engineering journals of the 1860-1880 period make frequent references to BHS, because they were then a leading name. sic transit gloria mundi! This is an engraving from "Iron & Steel Manufacture" by F. Kohn published in 1873.
" In the year 1859 an event took place which set the seal on the future prosperity of the Furness Railway. This was the establishing at Barrow of the Ironworks of Messrs. Schneider & Hannay. In the previous year (1858) this firm had bought land from the Furness at Hindpool on which to build their plant. This eventually became the steelworks and blast furnace plant of the Barrow Haematite Steel Company. 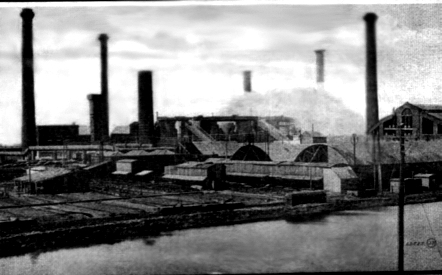 With the setting up of the smelting plant at Hindpool the Furness Railway lost most of the shipment traffic in iron ore, wince the bulk of this was now smelted locally; but this loss was more than offset by the pig iron and coke traffic which resulted from the establishment of Messrs. Schneider & Hannay's works. There were three furnaces in blast at the beginning of 1960."